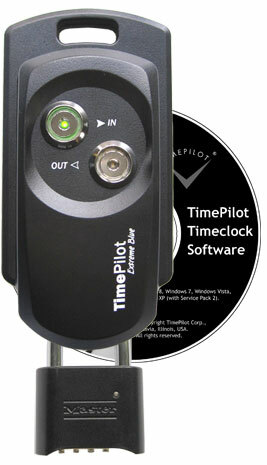 TimePilot's simple-to-use, weatherproof and portable time and attendance system with PC software. TimePilot Extreme Blue Enhanced and 1-year support contract. Your initial annual support contract is just $100 if purchased with TimePilot Extreme Blue Enhanced. (Regular price is $149). Click the details button to learn more about our support contract! Note: Ordering from the United Kingdom? Please place your order with our distributor. Click here to visit our UK distributor's web site. TimePilot Corporation warranty*:For one year after you purchase a TimePilot Extreme Blue Enhanced system, we will repair or replace (at our discretion) any malfunctioning hardware. The purchaser pays only the shipping to return the malfunctioning part to us. Return policy*: If you are dissatisfied for any reason during the first 30 days after you purchase a TimePilot hardware product (TimePilot Tap+, Extreme Blue, Extreme Blue Enhanced, Vetro, iButtons, iButton Receptor, etc.) from TimePilot Corporation, we will refund the purchase price if you return the product to us, freight prepaid and insured for the value of the product. If you choose this option, we hope that you will take a few minutes to help us understand why. Please be sure to call us for an RMA (Return Merchandise Authorization) number before returning the product. Please note: TimePilot software-only products such as TimePilot PC can be exchanged if the disk is defective, but we cannot offer refunds on software. We can be reached at (630) 879-6400 or at Support@TimePilot.com. *Notes: The money-back guarantee and warranty are void if the system is returned in a damaged state for any reason, including damage that occurs because of failure to follow installation instructions.